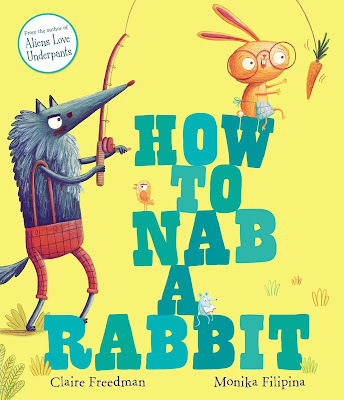 In How to Nab a Rabbit, we follow the famous Big Bad Wolf as he presents his book about catching pesky rabbits. He takes the reader on a journey with rhythm, rhyme and funny situations as he demonstrates his methods and foolproof tips for catching a tasty dinner. With a title to uphold, this wolf is determined to make a catch, so he starts with ‘the stalking strategy’, it doesn’t play out as planned then he discovers a huge inconvenience... bears live in the woods and they eat wolves! Four more methods follow, will rabbit stew really be on the menu? You must read the book to find out! The illustrations by Monika Filipina are adorable, they include lovely pencil textures and funny details seen in the character’s facial expressions, outfits and accessories. A fabulous book for reading aloud. Children will love the mishaps, rhyming and anticipation and of course they’ll have a laugh too! Claire Freedman is the author of the well-known Aliens Love Underpants and other books reviewed by Kids Book Review including Scaredy Boo and Oliver and Patch.